For most of my years in school, I was ostracized, teased, and tormented by others. More often than not I wasn’t invited to participate in anything social, be it play or, later, parties. This went on for years, with two periods that stand out in particular. Before I was eleven, I was blackmailed by a classmate for three months, and subsequently banned for some weeks by everyone in my class, at which time only one brave girl would sneak to my home to play with me. Then, when I was thirteen and lived with my family in Mexico, I was continually tormented and taunted by others and saw swastikas on the blackboard that were hastily erased when a teacher would come. At one time I was locked out by a group of girls who didn’t want me to be part of their cabin, and I was all alone all night, leaning against a tree and shivering. 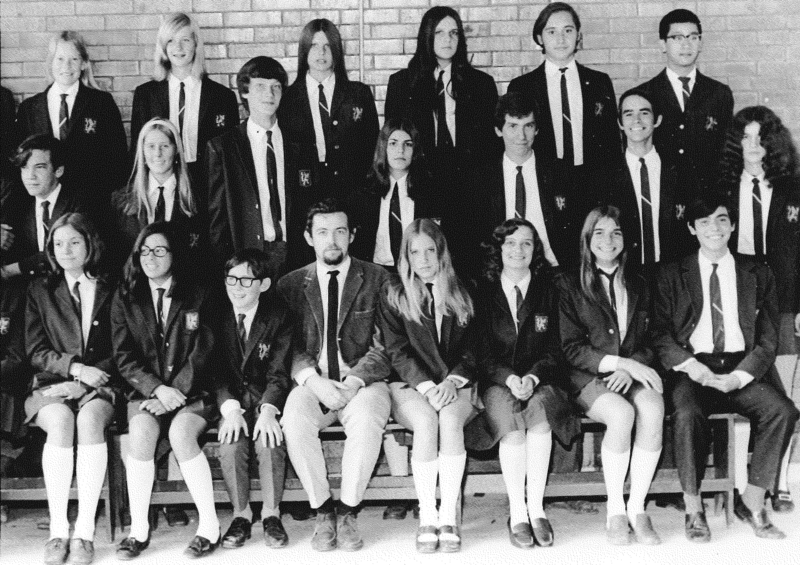 Miki at thirteen (front row, second from left) amidst her tormentors and other classmates. The word “bully” hadn’t existed in my world at the time. I had no context for making sense of the trauma I endured. Like so many people who suffer at the hands of others, I didn’t talk to anyone about it at the time and had no hope of being understood. Today, the phenomenon is widely recognized as a major stressor in children’s lives. The Bully Project estimates that thirteen million children are going to be bullied this year. One study indicates that 88% of children have observed bullying, and 42% in one poll of those who attended health ed centers admitted to having participated in bullying others. These numbers are staggering. Despite this growing awareness, most children still don’t talk about bullying. In a survey of US middle and high school students, “66 percent of victims of bullying believed school professionals responded poorly to the bullying problems that they observed.” Others provided other reasons for not talking about it, such as feeling shame at not being able to stand up for themselves, fearing they would not be believed, not wanting to worry their parents, having no confidence that anything would change as a result, and even thinking their parents’ or teacher’s advice would make the problem worse. I can see why the children don’t trust the adults. So often the response to bullying is one of belittling of the issue, as can be seen in Mitt Romney’s response to the allegations about his high school bullying, and in the attitudes of many other adults, even teachers and administrators. “Kids will be kids,” they say, or they look at bullying as indistinguishable from teasing and mostly harmless. At times the suffering of those bullied gets minimized, which only contributes to the shame they already carry about their experiences. For years after my own devastating experiences, I kept thinking that other people suffered much more than me. It took years for me to understand the full extent of the trauma I had experienced. At other times, the response is harsh and punitive. The bully as a person is seen as a problem. Here’s one troubling example. Nicholas Kristof, the New York Times columnist, organized a writing contest for school students about bullying. In an op-ed this week, he said about the essay writers who had been bullied: “You want to reach out to these kids and envelop them in a big warm hug and tell them that they are smart, sensitive human beings, a thousand times better than their tormenters.” I am troubled by this response. I want to ask, isn’t Kristof bullying the bullies by describing them this way in the nation’s leading newspaper? I would be hard pressed to believe that any change in the amount of bullying would arise from this characterization of bullies. Even more troubling is reading the winning essay, in which one girl describes her bullies as having “the self-entitlement of a celebrity heiress and the aggression of a Roman gladiator. Like vampires, they feed off the blood of the weak. They’re pubescent monsters.” This writing, to me, does not characterize a smart, sensitive person. Rather, I see in it the self-protective, separating, and angry response that can only perpetuate the atmosphere of violence. 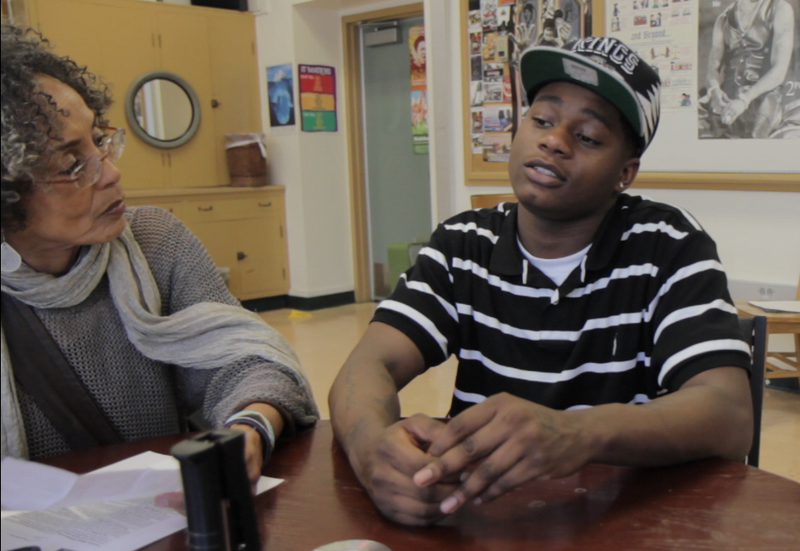 A listening adult ear: Restorative Justice for Oakland Youth director, Fania Davis, with 10th Grader Jihad Seymour, in a still from a forthcoming film by Cassidy Friedman, Stories Matter Media. A way out of either belittling or punishing bullying is to understand that bullying is a community affair, not an individual aberration. Since the problem affects everyone, let’s put in place preventive and restorative solutions that attend to everyone’s needs. Everyone in a school community needs safety, which can be provided by changing the factors in the environment, such as increasing adult supervision, staggering recess and lunch, and implementing measures to respond swiftly and compassionately to bullying once it happens. A bullied child needs empathic adults and friends who can help her or him speak up and move towards finding supportive friends and inner confidence—complex abilities that few of us can develop without help. Compassion doesn’t mean accepting the behavior. It does mean accepting the child who engages in it. A child who bullies also needs support for a culture change to happen. Those who bully are usually shamed and judged by others. That punitive kind of response deprives them of opportunities to understand themselves and to learn about their own needs. They need empathic friends and adults who can help them grasp why they are choosing this behavior, and what they can do instead. Instead of classifying bullying as a crime, as proposed in one Canadian blog site, compassionate community approaches find ways to gain a deeper understanding of what causes bullying in the first place, and what can be done to restore trust once bullying has happened. Punishment does not restore trust. More often than many of us would like to believe it plants or waters seeds of future violence, because it contributes to shame and self-loathing, fertile ground for violence to grow in. I want to emphasize again that letting go of a punitive response does not mean accepting the behavior. We can all respond to incidents of violence in ways that restore trust and respect, rather than create further hurt by demonizing and punishing those who bully. The success of programs such as Roots of Empathy and the extensive research about the cycle of abuse and the deep links between shame and violence lead me to a deep faith that the failure of our times is a failure in empathy rather than a loosening of strict control. We are bombarded by images which glorify violence even as we are admonished against it. We are provided with fewer and fewer avenues for loving connection with others. It is not cool to express affection, whether for teens in school or for all of us at work, for example. What can we do to increase the overall kindness of our culture? How can we provide children, whether bullied, witnesses, or current and former bullies, with avenues to explore their true human needs and develop strategies to meet them that are embedded in human relationships? I so deeply want to strengthen the fabric of our interrelatedness so we can nurture all children. A last word about Romney: Given his visibility as the presumptive Republican candidate for the Presidency, the community affected by his long-ago actions now appears to be the entire population of the US. What can Romney do that would restore trust? I wish he could recognize the momentous opportunity he has to engage in a restorative process, even after the person he is alleged to have tormented is now dead. He could visibly and publicly open his heart to the horror in which he participated and take ownership of it instead of dismissing it as a prank that went too far. He could, conceivably, provide a window into what the inner experience of participating in such an act feels like, so others who bully could possibly understand themselves better. Such an act could humanize him, others, and ultimately all of us. This entry was posted in Uncategorized and tagged bullying, empathy, restorative justice on May 18 / 2012 by Miki. Your article brings so many things to 'life' in me that am staying with the depth of it. What a fabulous article. One of, if not the best, articles on bullying I have ever read. The line about a "self-protective, separating and angry response". Wow. I can relate to that… No wonder they say defence is the first act of war. Would love to see Miki's response to this. Mine is that I just want to (again) (it is the Olivia you know) acknowledge your bravery and work and empowerment. I wonder how it must feel to see a son experience what you yourself experienced and feel so much for you.